Every Windows power user knows the command line is “the place” to get serious work done. The new Start Menu search box in Windows Vista opens the door to a whole new level of command line possibilities. One utility called Start++ extends the Start Menu search box to add even more features allowing you to use shortcuts to launch web sites and processes. Would you like to search Google from your start menu search box? Just type g followed by your query such as “g tweak vista”. 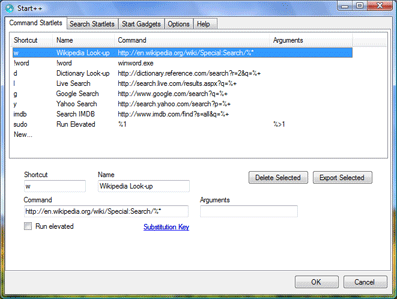 How about doing a quick search on Wikipedia? Type w and your query in the search box. The possibilities are endless because you can create custom shortcuts just like the examples above. On top of web shortcuts, you can also create application links that will launch an app and open a file. Almost anything is possible with a little customization of the Start++ utility shown below.